Have you been taking lessons for a few months and do not seem to be making progress? Do you wonder if you lack the ability? Have you thought about buying another horse that seems better? Do you think your trainer is boring to listen to? As riders we often give over control of our learning process to the instructor. Sometimes we say “Fix my riding problems” or “Get my horse to respond better to me.” We need to take control of our learning. Let me repeat what I just wrote – WE NEED TO TAKE CONTROL OF OUR LEARNING. Now I am not saying argue with your trainer every minute of the lesson…that never turns out well. What I am saying is that if you want to improve as a rider – come prepared to learn. 1) Have goals… Monthly and quarterly goals. Share with your instructor the goals you want to achieve. He or she can then work to craft a learning plan with you that will help you achieve those goals. A good conversation with your instructor is the key to building a good learning environment. But remember – a good conversation needs both you and the instructor to listen and hear what each of you is saying. 2) Do your homework between lessons. I remember back to the days when I was learning to play the piano and guitar. Mr. O’Brien would give me homework and I would practice…the day before the next lesson. With a twinkle in his eye, Mr. O’Brien would ask me how often I had practiced. As a 12 year-old I tried the “I practiced lots” answer. He knew and the one and only time I tried that – I knew that I was dancing a line between truth and a lie.Instructors know immediately if you have practiced. So be honest to yourself and your horse and if you have made a commitment to learning – do your homework. If you have not done your homework – let your Instructor know. Good instructors can help you get motivated in your homework and learning – because good instructors are also good coaches, cheerleaders, motivators, and mentors who want to see you and your horse succeed. 3) Eat before the lesson…even just a snack. In the last-minute dash to get your horse loaded and to the lesson or get ready for the instructor to show up you decide to skip breakfast or lunch (or both). You will have a big dinner after your lesson or the clinic. BAD IDEA. When you are hungry you will not learn as well. (Note: the large fancy coffee drink before a lesson will give you that sugar high stamina…but not the energy you need to learn). Have some fruit or nuts or something that your stomach can work on during the lesson.One of the instructors I ride and co-teach with each year is Connie Sparks in Montana. Connie feeds the herd of horses and youth before each clinic. Eggs and French toast is often on the menu – you know why – because Connie is a good instructor who knows the value of getting food into young (and old) bodies so that learning can happen. 4) Keep a journal and lesson log. Write down your thoughts after each lesson or clinic. When you take the time to keep track of your progress it is much easier for you to see your successes. In the journal or lesson log you can write questions regarding your homework…then it helps you connect to doing your homework and know what you want to ask your trainer at the next lesson. 5) Recap after the lesson to make sure you know your homework. Sit down after the lesson or clinic and talk with your instructor. Plan so that you have five minutes of talk time to recap what you learned and what you need to do before the next lesson. In all of my clinics, after each day, we have a chat session. I always ask people “What did you learn that you will take home?” This is to help them recall things from the clinic or the lesson that they found particularly important for their improvement. Taking a lesson or going to a clinic is all about learning so that you and your horse can improve as a team. Make sure that you are prepared to learn by following these five suggestions. Feel free to comment on this post with additional suggestions as to how people can improve their learning at clinics and lessons. Share this Blog and Share your Thoughts? With the upcoming State of The Union address by the President of the United States, it got me thinking about this process and how it compares to evaluating the State of Your Riding. Weeks of preparation go into the State of the Union Address, the President gives his speech, the other party gives a rebuttal, the news media and other people all share opinions about what the speeches meant, and a few others jump in along the way and offer yet another speech, rebuttal, or comment. In the State of the Union, there is some reflection on the good and bad events of the past year and there is a look forward to the next year and what needs to be accomplished. Well as equestrians, we should take some time to reflect on the good of the past year, the bad that we overcame, and where we are going in the future. The one thing we know as horse riders is that we need to evaluate our riding and the skills of our horse on a very frequent basis. The problem comes when we forget to evaluate honestly and get stuck in a rut. As a way to help — I offer four ideas for evaluating your State of Riding. 1) Take a lesson with a new clinician or trainer or coach. Step out of your comfort zone and seek the input or advice of someone else. Sometimes this can be in a video evaluation or an in-person lesson. I am not suggesting that you abandon your coach/trainer/lesson giver that spends countless hours with you; rather, I am suggesting you get an additional opinion. Those in my lesson program are encouraged, and in some cases, required to go ride with someone else at least once a year. As a coach, I value the input of other trainers for my clients. 3) Take a monthly video of your riding and then every three months play all the videos in one sitting. Do you notice changes for the better or worse? Are you riding better? Is the ride you took a video of today the exact same ride as three months ago — if that is the case you may not be progressing, pushing yourself, or you just may be at a loss for something new to try with your horse. This is a great way to perform a self-evaluation. 4) Have a non-horse person watch you ride and ask you questions. This can be very frustrating and difficult to hear. The first thing that comes to your mind is “What does he/she know?”. Honestly, if a non-horse person asks you a question about something you just did in your ride and you think — “I never do that” — it is likely that you are fooling yourself about your riding skills and how well your horse is doing. These are just a few ideas that you might consider using to help you review the “State of Your Riding”. As always, I look forward to you sharing this blog and your added comments. “Broke,” “Green,” and “Finished” Horses – Is this what we want? Have you heard about the “Dead Broke Finished Horse” that a friend purchased the other day. Or maybe you heard about the trainer down the road that has a “Horse that is Broke to Death” that you need to purchase or ride. I have seen people get giddy with excitement about the prospect of purchasing a “Broke” Horse. Still others are joyous about getting a “Green” horse. Some excitedly tell me that they finally have their horse “Broke” and can get some things done now and maybe even move on to getting him “Finished”. Normally about this time when I hear these stores I am grimacing and groaning. Broke and Green are not terms I want to use to describe the quality horses I work with and here is why. Many of the online definitions for the word “Broke” center around — having no money; bankrupt; To cause to separate into pieces suddenly or violently; smash; To vary or disrupt the uniformity or continuity of. As we move on and look at the online definitions of “Green” we find — The hue of that portion of the visible spectrum lying between yellow and blue, evoked in the human observer by radiant energy with wavelengths of approximately 490 to 570 nanometers. (Had to throw in the nanometer range for a few of the science geek friends who know me). I have not seen a naturally green colored horse so far in my life. For these first two words — nothing in the definitions I just shared with you are useful in describing a good quality horse. Surely most people know what you might be speaking about but that is the problem — these two words are totally open to interpretation based on experiences. Finally we come to the description of “Finished” — Highly accomplished or skilled; polished; Having no more use, value, or potential; washed-up; nothing more can be done with the item. Okay — so I might not mind having a highly accomplished or skilled horse but I certainly do not want a horse that is “washed-up”. What is the solution to this problem? 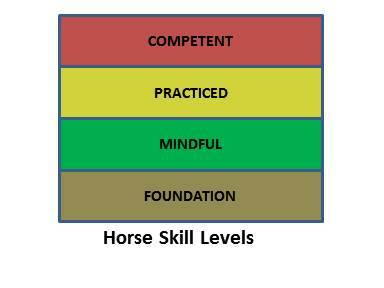 In the next section of this blog I want to share with you how I describe the skill levels of horses. With this description we shall all understand the ability of horses. In many things — a picture is worth a thousand words. I shall begin with Figure 1 that summarizes how I describe and categorize horses. I welcome your thoughts and comments and hope this blog is shared and discussed so we can all cease using terms like Broke, Dead Broke, Green, and Finished..
Foundation — On the ground or in the saddle the horse goes forward calmly, backs, and moves left and right (side to side). The horse knows to respect your space, stand quietly, tie to a solid object, pick up feet on command, and be groomed — all in a safe manner. The horse is learning that pressure and release cues/aides mean something and the horse responds. Mindful — A horse that is mindful has awareness. Certainly cues and aides are something that the Foundation horse learns. When they reach the mindful level, pre-signals and soft/subtle aides guide the horse. We might describe a horse being mindful as one that is moving forward and is feeling the rider and knows what is coming and responds with the lightest possible aide. Once you have a horse at the mindful level you are making that connection that leads to harmony, rhythm, relaxation and balance. A mindful horse is seeking guidance from the rider to know what it should do next. Practiced — This is a horse that understands the job and can get the job done. This horse can easily respond to aides with athleticism, quickness, and agility. With a practiced horse we no longer see hesitation by the horse. The practiced horse is one that comes with experience and is working towards that perfect maneuver with the rider. A practiced horse is frequently limited by the ability of the rider. Competent — This is a horse that has the necessary ability, knowledge, or skill to do something successfully — sometimes even when the rider is lost in the saddle. 99% of the time the competent horse can respond to the aide without hesitation and achieve success. A horse at this level excels with a good rider but can also help the less experienced rider succeed. As I wrote this blog to describe skills of the horse it dawned on me that we might be able to describe riders in much the same way. I look forward to you sharing and commenting on this information.